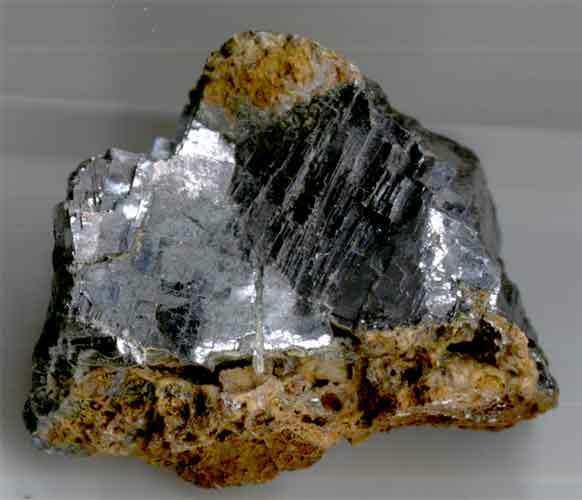 The ore used to extract silver was not a silver ore but Lead Sulphide (formula PbS), known as Galena or Galenite (named by the Roman Pliny) which contains 87% lead. 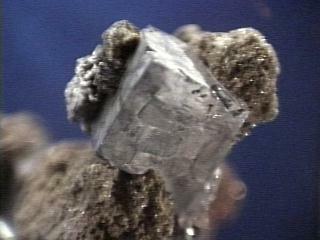 The local variety of Galenite is silver-bearing and is known as Argentiferous Galenite (formula (Pb.Ag)S ) and the lead obtained from this ore contains just a small percentage of silver - from 0.8% up to 5% (other sources say Laurion galena contains typically only 0.13 to 0.30% Ag). 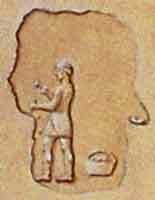 The ore as mined was not pure as it was mostly encased in rock, combined with earth, and also contained traces of iron ore and other minerals. Firstly it had to be pounded into small fragments on stone tables with rock hammers, then ground to a fine powder of 1-mm grain size in a stone mill (very hard work!). Then it had to be washed in a "washery" to remove as many of the impurities as possible. The washed ore was then dried and formed into bricks. Next, the bricks of washed ore were heated in a furnace where the lead/silver mixture was released from it's sulphide and separated from iron oxide impurities and run-off into "pigs" or blocks. 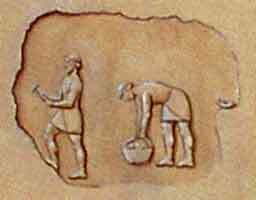 The pigs of lead were now placed in a high temperature (950 degC) 'Cupellation' furnace. 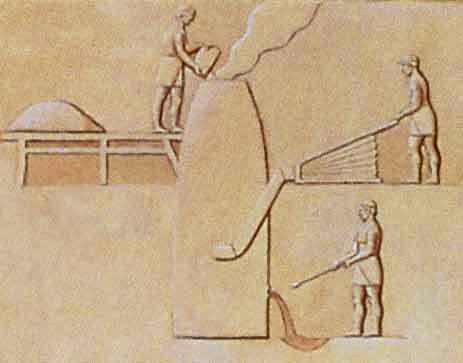 The metal was placed in a shallow open basin or ceramic bowl (the cupel or cup) in a furnace and a strong blast of air blown across the surface of the molten metal. The lead oxidized to form PbO (litharge, from Greek for the "spume of silver"), the relatively pure silver remained as metal. 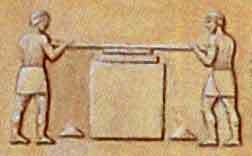 The lead oxide was skimmed off the surface of the hot mixture or absorbed into walls of the cupel (made of a special material - sometimes bone ash). 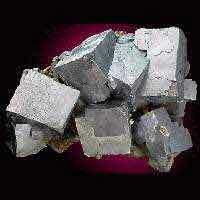 The silver that remained at the bottom of the cupel was run-off and solidified into blocks. Since lead is a cumulative poison, many slaves must have died from its effects; not to mention from the toxic sulphur dioxide fumes from the original lead sulphide processing furnaces - & the arsenic contained in small quantities in the lead. 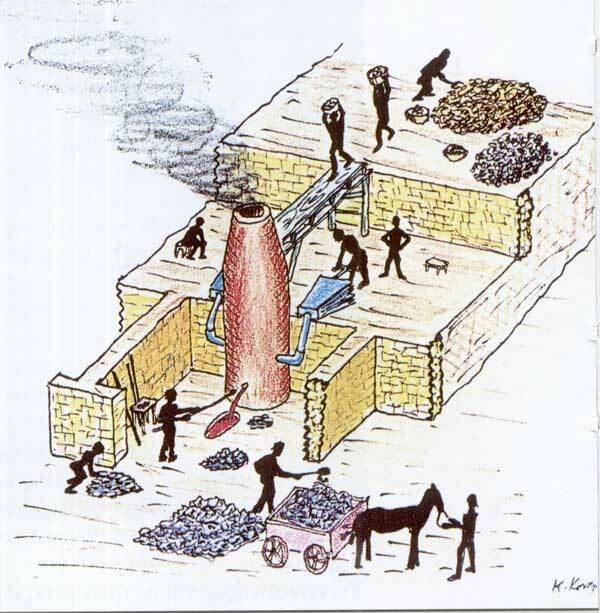 of labour required to obtain the silver - from mining through to the furnace. Enlarged views are shown below. Removing the impurities at the ore washery. and another removing sediment from the settling tank. to extract the lead containing a small proportion of silver. Noxious sulphur fumes are being emitted from the chimney. Sketch of smelter as we suppose it looked.